Many parents worry about keeping their children safe around the neighborhood, and increasingly, in the digital world. Fortunately, child abductions by strangers on the street or online are rare. Most kidnappings occur by people a child knows―usually a relative without custody. When children, particularly special needs kids, go missing, it's usually after they wander off without realizing the danger. Now You See Them. Young children, with intense curiosity about the world around them and eagerness to explore, can be the ultimate escape artists. 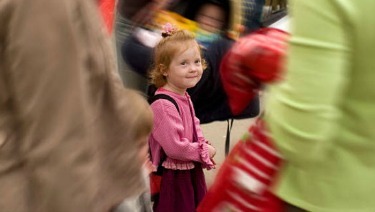 When you're shopping, at an amusement park, or otherwise out in a crowd, keep your eyes on your child at all times. If your child is prone to wandering off, it is best if someone in the family keeps constant physical contact, like holding hands. At School or Camp. When choosing a school, child care facility, or camp, ask about security measures in and around areas children learn and play. These include secure doors and gates, and policies that ensure only a parent, guardian or someone designated in advance can pick up your child. Other Care Providers. When hiring babysitters, always check multiple references and ask for recommendations from friends and family members. A reliable childcare provider should never leave the children alone in the house or yard--even for a minute. Stranger Things. Talk with children about the trusted adults in their life who help keep them safe, and what to do when they encounter someone they don't know. Teach them never to get into a car or go along with someone unfamiliar to them—even if the stranger is asking if they might know the "lost puppy" in their car. Practice with your child to forcefully say "no!" and move away as fast as possible, loudly yelling for help. Safe Zone. Your child should know to always tell you about being approached by a stranger―even if someone said they would hurt him or her, or you, if he or she told. Let your child know he or she will not be in trouble, and you will protect him or her from harm. ID at the Ready. No parent wants to consider the possibility that a child might go missing, but having good information on hand to help accurately identify and track a child if needed is important. At minimum, on a card or in a file, keep a recent photo, height and weight and, ideally, a set of fingerprints for your child. Missingkids.org has a Child ID kit that parents can keep at home. Risks & Benefits. Cell phones can help parents stay connected to their children, checking on whereabouts through phone calls, texts, and friend locator apps. Remember that people outside the family can use these location devices, too. Teach your children to not share their location settings with various apps and people, and not to post their cell phone numbers. Safety Net. The internet and digital media have dramatically changed children's social landscape. Even young children connect with people without their parents' knowledge―often not knowing themselves who's on the other end of their chat or video game. It is easy to share identifying or personal information without realizing it. Apps such as Google Hangouts allow anonymous group conversations, but pictures shared can easily reveal locations through a license plate or sports team logo. An innocent mention that parents are out of town may put a teen at risk. Have family discussions about safe technology use. Be Alert. Help support community-wide efforts to find missing children by signing up to have wireless Amber Alerts sent to your cell phone. Wandering Risk. Children with autism and communication disorders are at increased risk of "elopement" or wandering, leaving their homes and other safe environments without their families realizing it. A study in Pediatrics estimated that half of children with autism over age 4 had gone missing at least once. Many were attracted to water, highways or railroads, putting them at risk of drowning or traffic injuries. Children with communication issues may not respond when called by name, and may not know their way home. Extra Precautions. Parents may do their best to keep tabs on children who tend to wander off, but additional safeguards often are need. If possible, children can carry name and address cards or identifying wristbands and medic alert tags. Even the child's name marked inside his or her clothing may help. Alarms on doors can provide added precaution, as might a variety of wearable global positioning system (GPS) tracking devices that can clip onto belt loops, slip into pockets, or be worn as watches. Have a Plan. Many law enforcement agencies encourage families to visit the station and introduce their children, providing identifying information to keep on file in case the child wanders. Talk with your child's pediatrician about creating a family wandering emergency plan. Your pediatrician can give you additional strategies that may be helpful in increasing your child's safety, as well as information about local resources. The thought of your child going missing is a stressful one. But taking precautions, and having a plan in place in case a child does become lost, can help parents breathe a little easier. Ask the Pediatrician: When can my child use the public restroom alone? ​ ​Judy Schaechter, MD, MBA, FAAP, is a professor and chair of the Department of Pediatrics at the University of Miami Miller School of Medicine, chief of service at Holtz Children's Hospital at Jackson Memorial Medical Center, and past president of the national Injury Free Coalition for Kids. Within the American Academy of Pediatrics, she is a member of the Council on Injury, Violence and Poison Prevention and the Committee on Violence Prevention.